I had the opportunity to spend last Friday at the Stanford Graduate School of Business 2010 Conference on Entrepreneurship. In one particular session entitled What They Don't Teach in Business School About Entrepreneurship, moderated by Prof. Chuck Holloway, the entrepreneur panel threw out a few comments that I thought worth sharing. Kudos to the organizers of this panel session! "Business schools overteach how rational things are." (Will Price) - Would that real life business issues would get wrapped up neat and tidy after a 90 minute case study session. Unfortunately, because people are inevitably involved, business is a bubbling stew of egos, desires, foibles, aspirations, and prejudices. While logic can tell one what should be done, it's emotion that often determines what and whether something actually gets done. "The probability of a business deal closing declines by 10% every day it's delayed." (Mike Cassidy) - This applies whether the deal is a customer deal, an investor deal, or an employee deal. With respect to the last, Mike proceeded to describe how in his company, on the day of the final round robin interviews, they would extend offers to potential new hires they liked and ask them to commit that same day. I used to do the same at my companies. It's that emotional thing again. Any deal negotiation generates a lot of emotional energy which in turn creates momentum. Nothing kills momentum faster than a waiting period. As every good sales person knows, you want to strike while the iron is hot and there is momentum to steamroll over the gauntlet of mini-roadblocks that inevitably crop up during the post-deal phase. "Everyone, before they graduate from business school, should be required to sell $10 worth of stuff, anything. Selling is underestimated." (Nazila Alasti) - For me, this comment wins the prize for being the single most practical tip one can give a budding entrepreneur. In order to do this, you have to figure out what "stuff" is, how to position it in such a way that someone will pay you for it, and then actually convince them to pay you; product/market fit, business development, and sales in a nutshell. I wonder how much business education would change if this became a graduation requirement for an M.B.A.? I wonder how many more startups would succeed if this were part of the founding team screening process? Thanks to Will Price, Mike Cassidy, and Nazila Alasti for some great, real world insights. As human beings, we enter life with a natural bias towards the tangible, those things that we can see, feel, hear, or touch. Furthermore, those of us trained as engineers, scientists, mathematicians, accountants, economists, or financial analysts have an almost holy reverence for data especially the numerical kind. "Show me the numbers!" we cry. Naturally, this bias carries over to the startup world, particularly if the entrepreneur comes from one of the aforementioned disciplines. So? What's wrong with that? Nothing, provided that we remember that much of the value inherent in a startup lies in the intangibles; intangibles like inspiration, creativity, employee morale, ethics, customer loyalty, brand awareness, energy, boldness, and vision. What is the value of a creative environment? How does one measure the ROI of employee morale? How does one assess the impact of workplace energy? People have tried and continue to try quantifying intangibles with satisfaction surveys, brand unaided recall percentages, and customer retention indices. But even these are difficult to tie to the financial bottom line. At best, the intangible's metric is statistically correlated to some revenue, expense, or asset measure, but it's still squishy, lacking the firm certainty of a hard expense like wages. One of the few places financial accounting1 and intangible value cross is when a company is sold and a mysterious item called goodwill appears on the balance sheet of the acquiring company. What is goodwill? It's the excess of the purchase price over the net tangible assets of the acquired company. This gap represents the intangible value created by the acquired company. In the case of an initial public offering (IPO), the intangible value usually shows up as additional paid in capital which is the cash the company receives from the sale of its stock in excess of par value. If you don't think this is significant, let's take a look at Google. On June 30, 2004 just prior to their IPO, Google had a net assets of $589 million. On September 30, 2004 shortly after the August 14th IPO, Google's net assets were $2,589 million due mainly to an increase in additional paid in capital of $1,540 million. In other words, investors paid over 2-1/2 times what Google's pre-IPO net assets were worth! And goodwill? Well Google is an acquirer of startups as well. As of December 31, 2009 the goodwill on Google's balance sheet stood at $4.9 billion. So am I saying that we should ignore the numbers in running our businesses? Of course not. (Anyone who's ever worked with me can attest to my penchant for metrics.) But given the human bias towards the tangible, it is up to the entrepreneur to make sure that the intangibles are not marginalized by what's been called the tyranny of the tangible and that it receives a proper weighting in decisions that affect the long term value of a company. Small wonder that in recent years, the elevator pitch, which rarely contains distracting numbers, has become such a prevalent sorting tool by many VCs. Beware of false precision - Beware of decimal points. Just because the number popping out of the sales forecast spreadsheet says $1.5427 million, does not mean that it is so. How precise were the numbers going in? Are you sure this isn't more like $1.5 +/- $0.5 million? Know the limits of your financial models - Closely related to the above. Linking your total available market and customer acquisition estimates into your revenue model does not make them more precise2. Models are useful for understanding dependencies and possibly variable sensitivities. But don't expect a +/-5% sales figure derived from input variables with a +/-25% uncertainty. 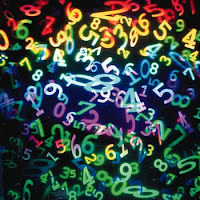 Temper the numbers with common sense - Do the numbers seem surprising? Maybe they need a closer look. But how do you do this when you have no idea what a surprising number looks like? This is where business can be more of an art than science, where experience, intuition, and a dose of common sense come into play, and often what separates the successful from the unsuccessful entrepreneurs. As a chemical engineering undergraduate at MIT, I was required to take a class in heat and mass transfer. One of the exams required us to calculate the time it would take to cook a strand of spaghetti. Of course, we had been armed with all the appropriate equations, knew the simplifying assumptions, and were given the relevant dimensions. I don't recall whether I got the answer right but what I do still remember was the post-test review. Here, the professor informed us that student answers to the spaghetti problem ranged from less than 1 microsecond to over 1000 hours! "Dear Professor. I've obviously made a mistake in my calculations because it shows the spaghetti taking 100 milliseconds to cook. Now I know that's wrong because spaghetti takes at least 5-10 minutes to cook...."
The student received an A. For all you accountants out there, yes I am aware of the fact that I 'm grossly oversimplifying things. For all you statisticians and investment analysts, yes, I'm also aware of Modern Portfolio Theory, Harry Markowitz, and the concept of co-variance which I'd argue rarely applies here. More applicable here is the old programmer's rule of GIGO ("garbage in, garbage out"). Sorry, I just can't recall the exact wording after 25 years. "There aren't enough hours in the day...."
"If only we could get some additional funding...."
"By the end of the day, I just want to collapse...."
The main reason we need money or expend energy is to execute something or pay someone to execute something, in some period of time. The less time we have or the broader the scope of activities, the more money or energy that has to be expended. One way to reduce both is to narrow the scope by focusing. This is in fact one of the tenets of the Lean Startup movement, which is to strip down activities to the bare minimum necessary to develop a scaleable business model, thereby minimizing cash burn. In fact, one sure way to cause your startup to fail is to take on too many activities simultaneously. The rationale behind this is to maximize your chances of gaining traction. But this is faulty logic. If I have ten critical items that need to be done, I'm better off completing 6 of the 10 and letting 4 drop than making 60% progress against all 10. In the first case, I at least have some completions that I can move forward on. In the latter case, I have nothing. Incomplete is equal to zero. So where does focus come from? It comes from having a vision. Only with respect to a vision can one decide what to focus on and what to drop. Vision ultimately stems from the creativity of the entrepreneur and the startup team. But vision does not occur in a vacuum. It rarely occurs as a single flash of brilliance. In most cases, vision evolves as one learns new things, usually from other people who are experts in their field. In a quote attributed to Steve Jobs, "Creativity is connecting things." A recent article entitled "The Innovator's DNA," does a nice job of covering this. 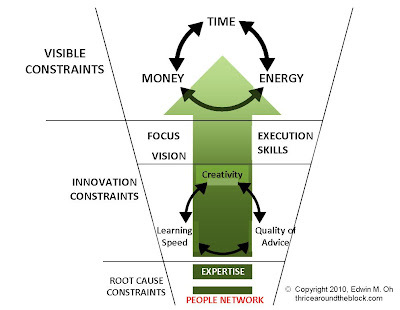 This creativity, learning speed, quality of advice loop represents in my diagram what I call an innovation constraint. I define learning speed as how quickly one can gain insight into whatever knowledge, data, or lesson needs to be mastered. Quality of advice refers to the source of that data. The highest quality advice comes from someone who is an expert in their field, which to me means someone with a broad scope and depth of theoretical knowledge mastered over time through practical experience. The faster one can iterate through this cycle, the more effectively one can craft an accurate vision of what needs to be done, focusing time, money, and energy. So in one sense, the root of creativity is expertise. So how does one find expertise? By networking with people. The problem in finding expertise when you personally lack the knowledge to evaluate it, is that you can't necessarily recognize the true experts from the posers. The solution is to start with people whose expertise you do respect (from your own experience), who are more knowledgeable in the general direction of the expertise you are seeking, and get them to refer you to someone they deem to be more expert than themselves. For example, if I'm looking for an expert in laser process licensing, I might start with either my patent attorney or laser designer and get their referrals. From their referrals, I would try to get other referrals until I reached the point where I thought I had the right person. I would then follow this up by checking on that person's references. In addition to providing the grist for the creativity mill which leads to vision which leads to the ability to focus, the network is also the source of the people with the to execution skills needed by a startup to do the work. The recruiting process is ultimately the same as the expertise search process just outlined. This process, obviously, takes time. And herein lies what I believe is the ultimate root cause constraint to a startup's success: one's people network. So the better my people network and the faster I can build it, the faster my learning speed and the better the quality of advice I'll receive that will spur my creativity to craft a better vision at the same time enabling me to find people with the right execution skills to focus on the right priorities thus saving me time, money, and energy. I think it's time for me to set up another lunch. (1) Dyer, Jeffrey, Gregersen, Hal, and Christensen, Clayton, "The Innovator's DNA," Harvard Business Review, (December, 2009). Are you stuck in a measly $250 million market? Venture capitalists about to reject your business plan because you can't show them the billion dollar market they need for their returns? Can't check the box on that billion dollar market slide you need to get funded? As an experienced technology marketeer, I can help. Using my Market ADvancEment & UPward Estimation (MADEUP) Method, you can muscle up your puny $250 million market into a $1 billion, $3 billion, $5 billion, even $10 billion dollar market! Just follow MADEUP’s six simple steps. Step 1: Present TAM not SAM – Present your market in terms of Total Available Market (TAM) not Served Available Market (SAM). While SAM is the actual product and substitutes being purchased by users today and for which there is hard data, TAM represents the SAM plus potential users of your product. After all, your 80 year old Aunt Edna could be interested in the latest social networking site for extreme skiers…. Step 3: Redefine the market scope - Tell me what market size or share you want, and MADEUP can give it to you just by adjusting boundaries. Current market for light sabers limited to the number of Jedi Knights and Paduans in training? Not if you include all the loggers on Endor (or the rest of the Empire for that matter) looking for fast, precision tree cutting tools! Step 4: Harvest the most favorable data from multiple sources – There are usually multiple market studies out there all with different assumptions and therefore different data. As long as the data descriptions are close enough, just cherry pick the most favorable estimates into one summary study. With MADEUP, go ahead and combine the linearly extrapolated 2009 estimate for PDA's from that old 1999 study with this year's estimate for smart phones to get the TAM for handheld productivity devices! This method has the added benefit of giving your estimate multiple footnotes for added credibility! Step 5: Stick to dollars not units – Always estimate the market in dollars (or euros or yen) never in units. That way, you can tweak your estimate by adjusting the unit average selling price (ASP). Need to bump the estimate by 20%? Just change the ASP from $1.00 to $1.20! After all, your product’s so hot that customers will gladly pay extra for it! Step 6: Finally, extrapolate! – Convert a small today market into a billion dollar market of tomorrow by carefully adjusting compound annual growth rates (CAGR). And don’t confine yourself to linear extrapolations. With MADEUP, you can experiment with exponential or power law growth curves! Get a little extra boost by combining this with favorable ASP trend assumptions. DISCLAIMER: MADEUP estimates should not be used for top down projections of revenue. (This is where your business plan states that if you just get 1% of the TAM, you’ll be a $100 million company.) Some of the more experienced VCs are onto this and likely to point out that (1) a market is not the same thing as a customer and (2) competitors aren’t likely to let you just waltz in and take their share. The more difficult VCs may even accuse you of not understanding the market at a deep enough level! This may lead them to dig deeper into some of the assumptions behind the MADEUP estimate. For more information about MADEUP, call 555-1515. Operators are standing by! P.S. Even if you don’t have a billion dollar market, you might still have a great business which may or may not be VC backable. Not everything is or needs to be funded by VCs. Consider looking for alternative financing versus dressing up your business as something it's not.